WHEAT’s M anagement Training and Mentoring Program successfully provides On-the-Job Training, and participation in authentic workshops teaching Marketable Skills in MANAGEMENT for successful employment leading to self-sustenance. WHEAT’s program is unique in its provision of management training, on-the-job experience, case management and mentor supports all leading to employment. 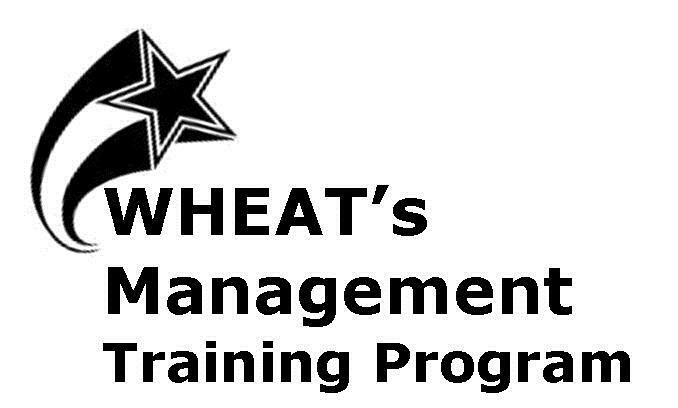 WHEAT’s program of high-level, training with outcomes of Certification in Management and living wage employment includes quality workshops, caring mentors and ongoing case management and are the keys to success in WHEAT’s Management Training Program. Among both women and men, median weekly earnings for those working full time in management, business, and financial operations jobs were higher than in any other major occupational category (“BLS Reports” 4). The Program includes dynamic workshops by business professionals who inspire and educate the participants in the technical, human, and conceptual skills of Personal Finance and Development, Management Skills, Resume Building, Interview Skills; and trained Mentors for each participant. Specific Management workshops include Customer Service; Financial Management; Recruiting, Training and Supervising Staff; Human Resources and Personnel Policies; Information Technology. Workers in occupations requiring higher education and characterized by relatively high earnings—such as management, professional, and related occupations—were less likely to be classified as working poor, 2.2 percent in 2015 (“BLS Reports” 2).